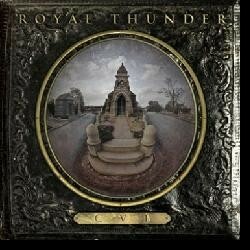 Royal Thunder was formed in 2007 and released their first EP independently. After this release Relapse saw something in this hardrocking trio. CVI is their first full length release via Relapse and seeing their growing popularity I expect that this won’t be the last one. Royal Thunder’s sound is not easy to describe. They have some hints of old seventies rock (think Black Sabbath, Led Zeppelin) in their sound, but also some more modern stoner influences. Psychedelica is also not far away and also some blues fragrances can be find. This is just a mighty fine melting pot of various ingredients! Miny Parsonz really stole my heart with her voice. Nothing angelic, but a real rough rock voice. She has some Courtney Love in her voice, but the vocals of Miny sound more sincere and her range and possibilities are less limited. Just hear her moan and groan on ‘Parsonz Curse’ and ‘Whispering World’. And the almost tortured vocals on ‘Sleeping Witch…wow. Easily to say that her voice is the number one selling point for Royal Thunder. The other two are no slouches either (Jesse has already been replaced), just listen to the first few minutes of ‘Blue’ and you exactly know what I mean. Also the eerily plucking of the strings in ‘South Of Nowhere’ gives that heavy feeling that one likes with this kind of music (excellent pace change and drumming in this number by the way). I would also like to mention the production. It has that old school buzzing sound, but the sound is still kept clean and crisp, so the buzzing doesn’t over scream the rest. I could sing their praise all day long, but you really just need to pick up this disc and fast!